Ji Yun KIm, left, is our Korean exchange student attending Unionville High School. She is a 16 year old from Busan, South Korea, a seaside city known for its beautiful beaches. Her English name is Aileen Kim. 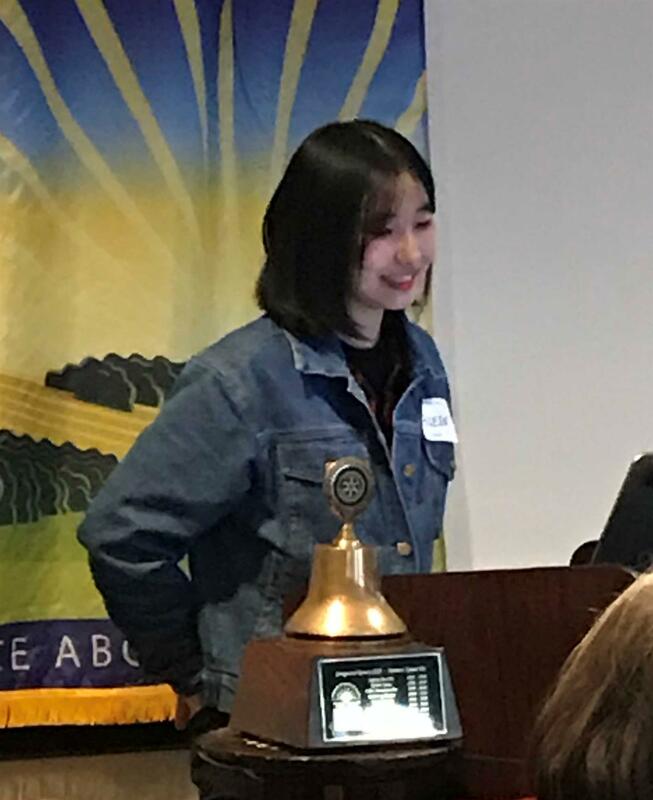 Aileen was sponsored by the Busan Hoedong Rotary club for her exchange year. Aileen has long wanted to come to the US. She fell in love with our country through American films. Her favorite is Spiderman. Hopefully she will not be disappointed by our lack of such heroic crime fighters in the Kennett area. As a coastal city, Busan shares the low (frigid) winter temperatures of the rest of Korea, but escapes the snow much of Korea experiences. The city has four seasons with beautiful foliage in the fall just as we have here. Aileen's family consists of her parents and older brother, who is a musician. Her brother has been in a band since he was in high school and continues to play in bands now. Aileen shares her brother's interest in music but expresses it as a singer and dancer. She performs traditional Korean dances as well as dancing to her favorite musical genre, K-Pop. Aileen is a member of the World Angel Peace Corp singing group sponsored by Rotary. They sing at many district and other Rotary group meetings. They most recently performed at the Rotary International World Conference in Canada. Aileen's dedication to music is strong considering she spends about 2 hours per day practicing. An unexpected story Aileen told us is that Koreans celebrate Halloween. They celebrate by attending costume parties, but not trick or treating. Clearly Aileen enjoyed our version of Halloween when she reported she collected 128 pieces of chocolate through her trick or treat efforts.